On its way to a perfect 13-0 record in 2017, UCF only had a few close calls. One of those came against SMU, with the Mustangs within four points of the Knights heading into the fourth quarter. UCF held on, but SMU certainly showed its potential. The two teams will meet in Orlando this year, but the Mustangs are under new leadership. Chad Morris left for Arkansas, which opened the job up for Sonny Dykes. With Morris gone before SMU’s bowl game, Dykes took over early. Things didn’t quite pan out, with his new team falling 51-10 to Louisiana Tech in the Frisco Bowl. That game shouldn’t be indicative of the program’s direction under Dykes. He will still have to shake off that disappointing debut, but he has the tools to do so. Junior quarterback Ben Hicks heads into 2018 with plenty to prove. Over his first two seasons, he completed 57 percent of his passes for 6,499 yards and 52 touchdowns. That’s extremely impressive, but his top two targets from his 3,569-yard, 33-touchdown 2017 campaign are gone. Courtland Sutton (1,085 yards, 12 touchdowns in 2017) was drafted by the Broncos in the second round of this year’s draft. LSU transfer Trey Quinn (1,236 yards, 13 touchdowns) was the draft’s last pick after leading the country with 114 receptions last season. With Sutton and Quinn gone, the pressure is on Hicks to produce with a less-experienced receiving corps. James Proche (816 yards, six touchdowns) will be his No. 1, but there are less-familiar faces behind him. The Mustangs had the 19th-ranked passing offense in 2017, but their 42nd-best rushing offense left some to be desired. That might have been more indicative of SMU’s philosophy than its actual talent in the backfield. There could be more carries to go around this year with less experience at receiver. Xavier Jones (1,075 yards, nine touchdowns), Ke’Mon Freeman (543 yards, 11 touchdowns) and Braeden West (568 yards, two touchdowns) are all back in 2018, which should give the Mustangs plenty of reasons to go with the run a little more often. That mix of experience and production, plus the talent along the offensive line, will be helpful for Hicks as he feels his way through finding his new top targets. Where SMU ran into trouble last year was on defense. The offense averaged 37.8 points per game, but the defense allowed an average of 36.7 per game. The unit did keep the top-ranked UCF offense to just 31 points last season, which tied for the Knights’ season-low. However, there won’t be a lot of experience returning for new defensive coordinator Kevin Kane. Kyran Mitchell will most likely lead that side of the ball from the linebacker position after finishing 2017 tied for a team-high 15 ½ tackles for loss. His 73 tackles ranked him third on the team. There are some other talented returners in Tyeson Neals, Jordan Wyatt and Mikial Onu, but SMU has plenty of work to do in order to become a formidable defense. The 2018 SMU Mustangs appear to be similar to the 2017 squad, but with less talent and firepower at receiver. The offense might have to carry the team again this year until the defense plays at a higher level. Hicks is a great talent to have at quarterback, one that should be up to the challenge of replacing two of the country’s most productive receivers. The schedule is pretty tough for SMU even before the matchup in Orlando. The Mustangs will face TCU, Michigan (on the road) and Navy before seeing the Knights on Oct. 6. That’s a tough gauntlet to run before meeting the defending conference champions. Some easier contests follow, but it might be challenging for them to end up as anything more than bowl-eligible. 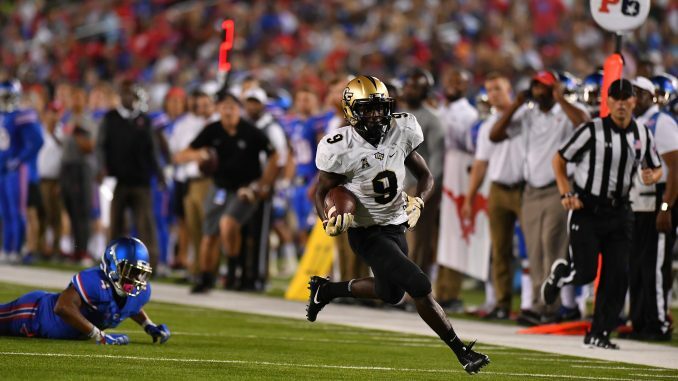 Final Thoughts: SMU played UCF extremely tight in last year’s meeting, but some unusual circumstances were involved. Coach Scott Frost was expecting his first child at any minute and spent the night wondering if he would be on a plane home before the end of the game. Plus, quarterback McKenzie Milton had a rare off night, tossing two interceptions. With this year’s game taking place in Orlando and new coaches on both sides of the field, things should remain interesting. The Mustangs can put up a good fight and should remain competitive this year, but they aren’t at the Knights’ level yet.